ISLAMABAD: The government allocated a total of Rs35.6 billion for the health sector in the annual budget for the fiscal year 2013-14. Following the 18th constitutional amendment, health has become a provincial subject. However, the federal government still runs several national health-related programmes. The federal government allocated Rs9.9 billion for health affairs and services and under the Public Sector Development Programme (PSDP) a sum of Rs25.7 billion has been set aside. 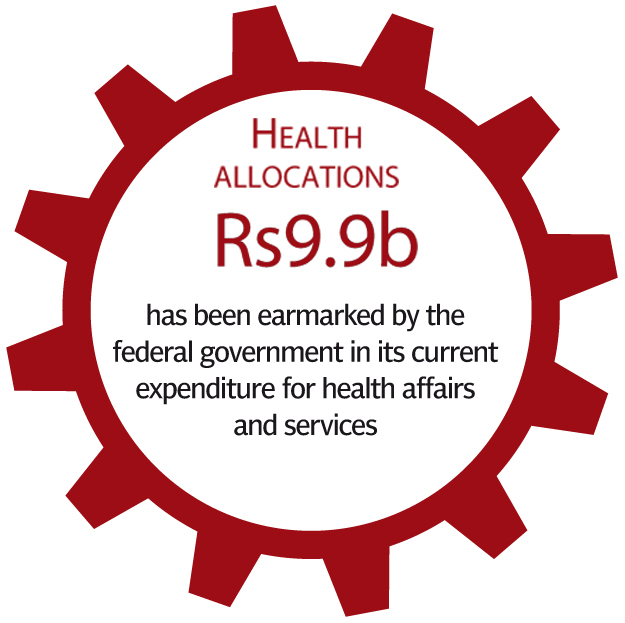 In the financial year 2012-13, a total of Rs22 billion were allocated for the health sector. According to the budget document, the amount has been allocated by the federal government for the 17 ongoing schemes and one new scheme. Under the PSDP, an amount of Rs2.8 billion has been allocated for the Expanded Programme on Immunisation, (EPI) along with Control of Diarrhoeal Disease and National Institute of Health (NIH), Islamabad. The government has allocated Rs750 million for on-going National Food Security and Research Division schemes under PSDP 2013-14. For the financial year 2012-13, a total of Rs495 million were allocated. According to the document, out of the total allocations, Rs230 million have been earmarked for the Research for Agriculture Development Programme and Rs120 million will be spent on the establishment of a national institute of genomics and advanced biotechnology in Islamabad. Among other allocations, Rs71.444 million are to be spent for the upgrade and setting up of animal quarantine stations in the country, Rs72 million for a special programme strengthening SPS facilities and quality inspection services in compliance with the World Trade Organisation. Similarly, Rs65million have been allocated for the establishment of a Pakistan-China cooperation for agriculture research and development, while Rs45 million will be spent on monitoring of crops through satellite technology. The federal government has pumped down money for ensuring human rights by allocating Rs78 million for ongoing schemes of Human Rights Division in the PSDP for 2013-14. Previously, a total of Rs 1260 million were allocated for the division. According to the budget document, this amount will be spent on the establishment of 12 Women Centre/Shaheed Benazir Bhutto Centre for Women across the nation.